and you can anonymize your data before sending it to external calibration service. 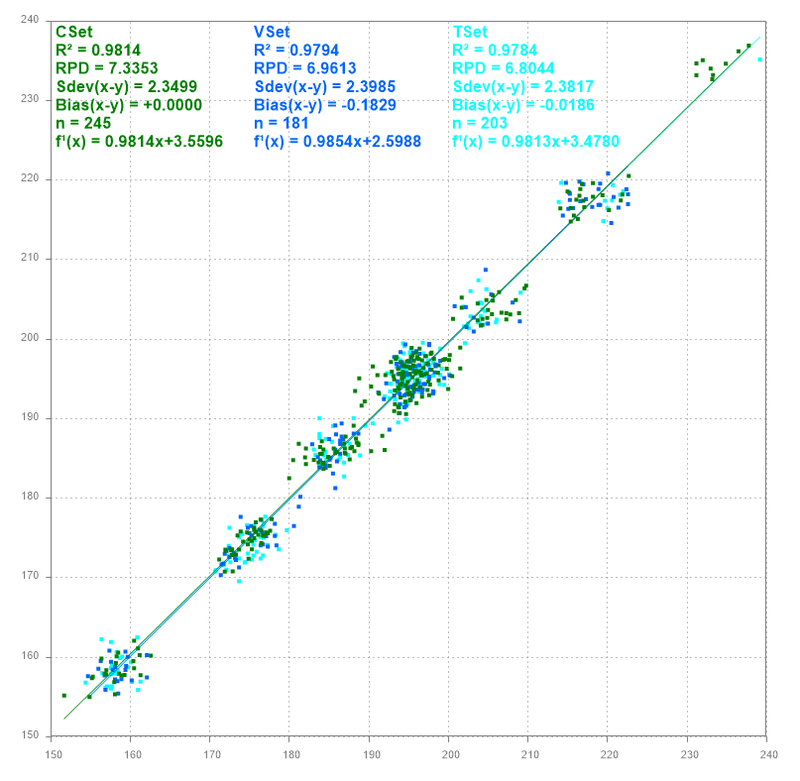 Free NIR-Predictor software for smart predictions results with outlier check. Create bulk predictions report of new or historical data with drag & drop. Compatible with your NIR Spectrometer data. Optimized Calibration Models at fix cost without spending your time. Get more out of your NIR system, feasibility studies you never tried and increase analysis performance. No need for owning and using a Chemometric software. Interpretable models with access to the wavelengths selection or complete calibration settings report. You own your data. You have full control over your data. We do not collect your data. Durable access to local prediction software and local calibrations with unlimited number and fast predictions. With JCAMP-Anonymizer software you can anonymize your data before sending it to external calibration service. This entry was posted in Analytical NIR Method Development, Calibration Development, Calibration model optimization, Feasibility studies, Model maintenance, Near-Infrared Analysis Software, NIR optimizer, NIRS Analysis Software and tagged Artificial Intelligence driven Machine learning for NIR Spectroscopy, Automated NIR calibration, Automated NIR Feasibility Studies, Automated NIR modelling software, Automated NIR models, automatisierte NIR-Machbarkeitsstudien, automatisierte NIR-Modelle Automatisierte NIR-Kalibrierung, automatisierte NIR-Modellierungssoftware, data anonymization and cloud services, Digital Services for calibrations for laboratory NIR instruments, Digitale Dienstleistungen für Kalibrierungen für Labor-NIR-Geräte, Digitalisierung der NIR-Vorhersagemodellierung, Digitalisierung der Vorhersagemodellierung, Digitalisierung in der Nahinfrarotspektroskopie, Digitalisierung in der NIR-Spektroskopie, Digitalisierung in NIRS, Digitalization in near-infrared Spectroscopy, Digitalization in NIR Spectroscopy, Digitalization in NIRS, Digitalization of NIR prediction modeling, Digitalization of Prediction Modelling, Feasibility study of Near Infrared Spectroscopy (NIRS), improve the prediction performance of calibration models, Künstliche Intelligenz gesteuertes maschinelles Lernen für die NIR-Spektroskopie, lab automation in spectroscopy, laboratory analytical NIR software, Machbarkeitsstudie zur Nahinfrarot-Spektroskopie (NIRS), Nahinfrarotspektrometrie, Nahinfrarotspektroskopie, NIR analysis software for the Lab, NIR analytical laboratories, NIR analytical procedures in the Lab, NIR Analytical Software, NIR Analyzer Software, NIR control laboratories, NIR data anonymization, NIR Lab Analyzers, NIR Lab Software, NIR Lab testing and screening, NIR Laboranalyse, NIR Labs Software, NIR Methodenentwicklung als Dienstleistung, NIR Methodenentwicklung als Service, NIR Modellerstellung, NIR Prüflaboratorium, NIR Prüfstelle, NIR Qualitätslabor, NIR Qualitätsmanagement, NIR Spectroscopy in Laboratory, NIR Spektrometrie Quantifizierung, NIR Spektroskopie-Software für die Methodenentwicklung, NIR Spektroskopie-Software für die Methodenentwicklung NIR Modellerstellung, NIR test lab, NIR testing laboratory, NIR-Analysator-Software, NIR-Analyse-Software, NIR-Datenanonymisierung Datenanonymisierung und Cloud Services die Vorhersageleistung von Kalibriermodellen zu verbessern., NIRS digitalization strategy, NIRS Food LabServices, NIRS Lab Software, NIRS laboratory analysis, NIRS Labs Analysis Software, NIRS Labs Software, NIRS Test Labs, NIRS-Digitalisierungsstrategie, Off-line NIRS lab analysis by admin. Bookmark the permalink.